China Glaze will be offering several new collections after the first of the year, and I have promo shots of two of those collections. 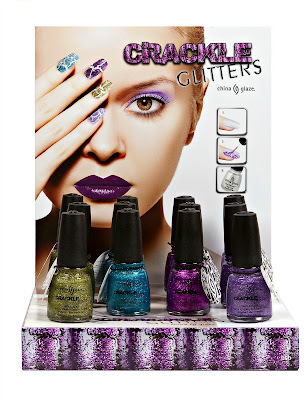 The Crackle Glitters Collection looks like an extension of their Crackle Metals Collection, but perhaps a bit more glittery. Prismatic is a mix of glitter and holographic glitter. I don't know about you, but I'm in a bit of a crackle/glitter overload right now, so I don't think I'll be indulging in these collections! The prismatic polishes look promising! The prismatic!!!!! ,if its a holo its on with me. Im sick of the crackle polishes as well. they need to find something else to make. I'm definitely over the crackle polish thing, too. But the Prismatic polishes look very interesting! Prismatic!!! I'm sooo done with crackles. Barely even started. I'm over the crackles but I want the entire Prismatic collection! As much as I'm over crackles and getting annoyed by them, I wouldn't mind owning a glitter version. I think it's cool, but not something I'm dying for. The Prismatic collection is really cool! I definitely want them. I'm looking forward to Prismatic. Not so much the glitter crackles though. Any word on the Hunger Games collection? I heard that would be released for early 2012 as well! I am drooling over the glitter crackles, because I still love crackle polishes! am I the only one tired of the crackle polishes? Cracked Glitter,bring it on! Prismatic glitter,yes! China Glaze knows what a lady likes!